Wings 3D is a 3D modeler http://www.wings3d.com/ that allows to draw 3D objects. It is the default tool to create the 3D wrl files in Kicad to have 3D view of printed circuit boards. Wings 3D can export the created objects into different format as *.pov used by the render engine povray. 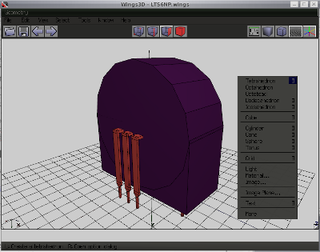 To work with it, emerge wings, run one of the tutorials and look at its manual found on http://www.wings3d.com/. For every hierarchical view a menu and set of operations are defined. It is therefore necessary when an object has to be modified that the Object Menu is selected. On the bottom there is the information line that gives hints about the active hot keys. R, M, L are the mouse keys. If everything is red (this can also be for sub objects) and you can not deselect anything you have to go to wire mode (not material mode) The space key deselects everything. In the outliner window, the material can be selected. Click middle mouse button and try to rotate around each axis. Click a mouse button to stop. The Q key it can be switched between tumble (rotate) and or track (move). The scroll wheel of the mouse can be used to zoom in and out. Select width of selected edges and color so it gives good contrast. Click on the icons to see the grid, the axes and be in orthogonal view. Click in the picture a menu pops up that depends on what is selected. It is either the vertex, edge, face or object menu of if nothing is selected it should be possible to select a basic object as a cube. Click on the vertex icon and the vertices get bold. Click on as many vertices as you want all get red. To de-select all press Space. To cut an edge (split into segments), click on the edge icon an select the edges to be cut. Click in the picture and select cut. New vertices are created on those edges. Select vertices (or keep them selected) and do the connect after having pressed the from the vertex icon. Put a cylinder, click on the face icon and extrude a piece. Select a face of an object as cube and do scale to form a pyramid. Selecting edges that for a loop. Select one horizontal edge between two objects and then on the horizontal menu select edge loop. Now all edges between the two objects are selected. Connect edges results in connecting the middle points of all edges. This creates vertices and edges. The face command intrude makes a object hollow. Select one edge then press G to get all edges of a cube and the select bevel to get chamfered edges. Mouse movements can be done with Ctrl key pressed, so it jumps 0.1 grid steps, or with Shift to move 1.0, or with Ctrl + Shift to move 0.01, or with Tab and then type in the numerical value, instead of continuous. To assign colors define first a material, de-select everything and select material, give it a name and then the material editor pops up. To see colors click on the small rectangular fields next to Diffuse, Ambient, Specular, Emission and adjust the colors. After that select the faces and add the material name. Select two faces with the same amount of edges that are opposite to each other on a body. Then use the command bridge. The name bridge sounds confusing, however a bridge in empty space creates material, whereas a bridge inside material creates a hole.